Marie Osmond has had tremendous success with her range of dolls. The Marie Osmond Dolls range is now one of the most successful brands in the industry. 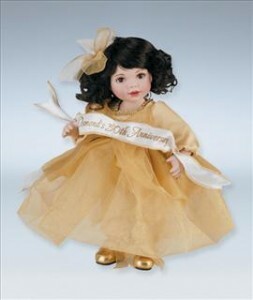 Born Olive Marie Osmond she was the only girl in the family of 9 siblings, and received many dolls from an early age. One of Marie’s fondest childhood memories was sharing her passion for doll collecting with her mother, Olive. As the Osmond Family traveled from country to country on their many world tours, Marie and Olive collected dolls from all over the world. Combining her love for dolls and her years of experience on television Marie Osmond chose to debut her doll line on electronic retailing giant, QVC. This also gave Marie the forum to show collectors that she truly was an avid doll collector and not just a celebrity lending her name as a token endorsement. Pictured left: Her first sculpture, a toddler doll she created and named after her mother, “Olive May”, set a collectible record on QVC, selling over $3,000,000 worth in it’s first airing at midnight. Since Olive May, Marie has sculpted a number of dolls, including “Remember Me”, “Baby Adora Belle” and her hallmark doll, “Adora Belle”. 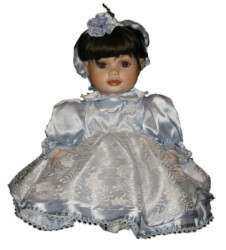 Marie Osmond’s halmark is is the beauty dot placed near the doll’s left eye, signifying Marie’s own beauty mark.